Whenever I have my students learn about birth defects, I always think that there ought to be a way to actually work with and apply this information in a way other than a test. So, imagine my excitement when Linsey Haywood of Snohomish High School, Washington shared the below Birth Defect Scenarios that she created for her child development class and graciously gave me permission to share them with you to use with your students when teaching about birth defects. What creative ways do you use to teach or reinforce birth defects? Share in the comment section below. Linsey’s class discusses genetics, watches “Biology of Pre-natal Development” DVD by National Geographic, discuss In Vitro Fertilization, and various options for getting pregnant. Students use the Birth Defect Information Packet she created about common birth defects for her students to use to solve the Birth Defect Scenarios. The Centers for Disease Control and Prevention has a great deal of information about specific birth defects. 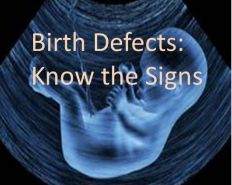 Linsey Haywood used the information from this website to create an information packet about common birth defects for her students to use with her scenarios (see attachments). The March of Dimes also has extensive information about specific birth defects. If you have students do projects and presentations about individual birth defects, have them create their own birth defect scenario and key based on the birth defect they’ve been assigned. If students take notes on each other’s presentations, the information/notes taken can be applied randomly assigned scenarios. Students wouldn’t necessarily have to do every birth defect scenario created, especially if it’s a large class.